Las Violetas is a very special Café born in the beginning of the springtime of 1884 (Sept 21st) and is one of the most traditional Cafes of Buenos Aires and as private tour guide Buenos Aires I use to join my Customers there. 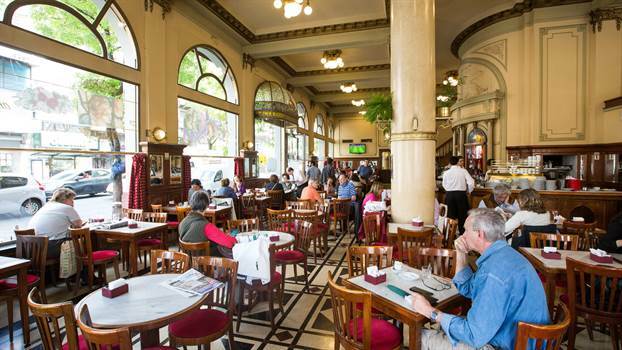 Las Violetas is the last Cafe of a line of special traditional Cafes which starts very close the Plaza de Mayo, and runs all along the Avenida de Mayo and Rivadavia Avenue. Practically located at the border of the tourist area Confiteria Las Violetas is the end of a line of jewels of authenticity and Porteño flavor, and as many of these Cafes are awarded as Remarkable Cafes (Café Notable) by the Buenos Aires Government. We use to attend there at the beginning of some of my out of the beaten path tour Buenos Aires. It was isolated in a beautiful building even before the neighborhood, an advanced building of five floors surrounded by farms and empty lots. 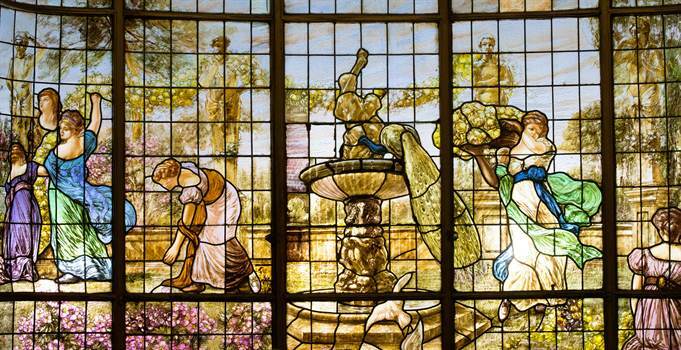 It was there to greet fifteen years later the arrival of the first subway of Latin America. At the beginning of the 20’s, an illuminated scenographer designed a set of fantastic stein glasses which were made with materials imported from France. Although only two walls face the street, they were placed along three of them in simulated windows creating an effect of amplitude and natural light, my job as private tour guide Buenos Aires is to show this “secrets” you wouldn’t discover by your own. During the times of the military dictatorship the Madres de Plaza de Mayo used to met under the facade of birthday celebrations and organize safely their activities searching for their offspring. During the late 90’s the economical situation of the country was rapidly running to a huge crisis and Confiteria Las Violetas was one of many victims: One day the employees arrived just to find a sign: “closed by balance”. The place never opened and the building started to damage. Finally it opened in 2001 after an exhaustive process of restoring to bring the place to its original style, Las Violetas happily reopened the doors and it still working, ready to surprise the visitor of my out of the beaten path tour Buenos Aires with its classics afternoon teas, which I don’t recommend because the place gets to crowded. Instead it is possible to visit in the morning and ask the huge plate of sandwiches, cakes and pastries, a classic of Las Violetas.